With my Dividend Hunter service, I provide a list of high-yield investments that I have deeply researched, and my analysis shows provide an attractive combination of current yield and dividend stability. As a high-yield stock expert, I often get asked questions about other stocks or investments that are not on my recommendations list. Sometimes a question will show me a new, attractive income investment. Others are learning opportunities on what not to do when picking high-yield investments. One investment category that generates a lot of questions is closed-end funds (CEFs). A closed-end fund is an investment pool with shares that trade on the stock exchange. Investors are drawn to CEFs because many have double digit yields and most paid monthly dividends. Unfortunately, with most closed-end funds there are usually more negatives than positives when evaluating one for investment potential. Here are a few of the problems you could see. Opaque communications from management on how a CEF is managed. There are not a lot of reporting requirements and any information you find on a fund’s portfolio may be months old. I sometimes refer to the CEF universe as the swamp of managed investment products. CEF shares can trade at a discount or premium to the net asset value (NAV). Fund sponsors do not redeem shares, so the only place to buy or sell is on the stock exchange. If you buy a fund trading at a premium, you are paying more than a dollar for a dollar’s worth of assets. Not a good deal. A CEF trading at a deep discount can be a danger sign that the management has been making some bad investments. Dividends classified as return-of-capital (ROC) are a big danger sign. Technically, return-of-capital are dividends/distributions that are not from earned income such as dividends or interest. While there are types and circumstances where ROC is not destructive to a fund’s NAV, unless you know for sure where the ROC comes from, it’s a danger signal to a CEF’s long term viability. To recap, the problem with many CEFs is that they are hard to analyze with several factors that on their face are dangerous to your long term investment success. With over 700 publicly traded CEFs, it is too much work to dig a handful of good ones out of the majority of swamp muck. Here are three high yield CEFs to dump now if you own them. 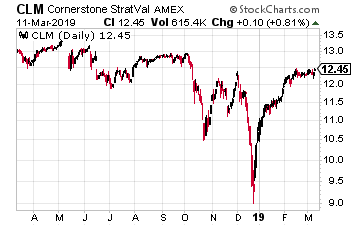 Cornerstone Strategic Value (NYSE: CLM) is a CEF with $570 million in assets that owns a portfolio of global equity (stocks) securities. CLM currently yields over 20%. There are two big danger signals for this fund. First, it is trading at an 11% premium to NAV. The high yield has caused unwitting investors to bid up the share price to 11% above what they would be worth if the fund is liquidated. The current monthly dividend is 20.53 cents per share. Out of that just one cent is earned income and two cents are capital gains. The remaining 19.3 cents per share is classified as ROC. Historically, most of the dividends have been ROC, which is reflected in the steadily deteriorating NAV. 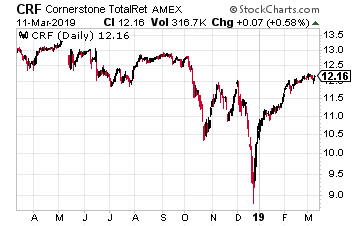 As typically happens, Cornerstone Total Return (NYSE: CRF) is a similar fund managed by the same advisory firm with the same problems. This fund is trading at a 12.5% premium to NAV. That is very rich pricing in the CEF world. The distributions breakdown also is like CLM. The current 19.85 cents month dividend has been paid for since the start of 2019. Each month 18.7 cents of the payout have been classified as return of capital. Ignore the 20% yield and avoid or sell CRF. 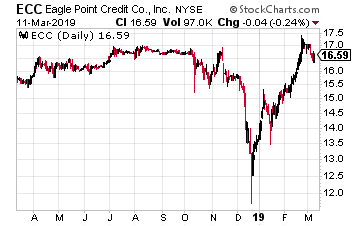 Eagle Point Credit Company LLC (NYSE: ECC) yields 14%. Due to recent large drops in the NAV, the shares trade at an eye-watering 23% premium to NAV. Out of the 20 cents per share monthly dividends, 7 cents have recently been classified as ROC. Put another way, ECC is earning just 65% of the dividend it’s paying to shareholders. Here’s the scariest part, the fund’s investment strategy: We seek to achieve our investment objectives by investing primarily in equity and junior debt tranches of CLOs. In plain English, they own the junkiest of the junk in the high-yield debt world. They’re approved by Congress and Americans are collecting checks every month for $2,123… even $9,586. Everyone is asking me about income right now, I’m pointing to venture royalties. Here’s how to collect 14 royalty checks this year. Click here. Writers like you are doing a DISSERVICE by emphasizing dividend yield (that includes ROC). Dividend yield should be worked out after subtracting Return of Capital (ROC). You need to educate public that even Income and Gains dividend yield may not mean much by itself. You cannot assume you will get back 100% of your cost. You need to work out your returns after factoring loss / gain on sale of the investment.